Oh, those silly, silly Bay area anti-Zionists. Their "NOTICE ME!, NOTICE ME" temper tantrums are getting more and more elaborate. At first, they were content to simply interrupt free speech, to muzzle any dissenting voices, because after all, only their side deserves to be heard. But that wasn't enough to get noticed. So they decided to vandalize kosher food products in Bay area grocery stores. But in spite of their congratulatory self promotion in the local independent media, still no one seemed to care. Their latest misadventure involves inserting mock ads into local bus shelters. This one, in a UC Berkeley bus shelter lasted mere hours before it was removed. Why did the shelter "ad" stand out so clearly as fraud and theft of service? Well, there is the small matter of everything on it being false. In particular, the "ad " asks that the University of California's partnership with the study abroad program at Hebrew University, one of the top universities in the world be rescinded. The First Board of Governors of this prestigious school included Albert Einstein, Sigmund Freud, Martin Buber, and Chaim Weizmann. Albert Einstein bequeathed his papers to the university, which has hosted many Nobel Laureates. Why would the vandals want to prevent UC students from having the opportunity to study at this prestigious school? Could they fear for the students safety? After all, the university was attacked on July 31, 2002, when a Palestinian exploded a bomb in the university's crowded cafeteria during lunch time. Nine people, including UC Berkeley's own Marla Bennett, were killed in the attack. Hamas claimed responsibility. No- ensuring student safety is not their motivation. 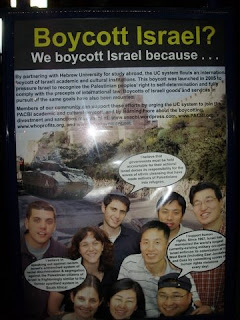 Thought bubbles on the poster say "I believe that governments must be held accountable for their action", ignoring the fact that Israel's academic communities function independent of the government. The vandals also ignore the fact that more dialog- academic, cultural and personal - is the key to peaceful co-existence. Their motivation for this, and all their actions is the immoral and hypocritical demonization of the only nation in the region that shares our values of liberal democracy, with freedom and civil rights for all its citizens. Josef Goebbels is sitting up in his grave right now, applauding. He feared that his best work was going to be lost on the history that followed him. Instead, Goebbels' best work was found, dusted off and put out for all to see by the very folks who put up these ads and pout and preen for the public. Waste no effort trying to attach logic to their motives, logic and reason have nothing to do with it-- hatred is blind and these folks have been blinded by the same forces that moved Goebbels and his band of evil fanatics to action and to failure. Only scorn and humiliation are their rewards. Airing today is an interview with David Friedman of the Anti-Defamation League on the rise of cyber-based antisemitism and its role in the wake of the financial crisis. David Friedman is the second guest on "Faith Complex," a Georgetown University production in conjunction with the Washington Post's "On Faith" section. "Faith Complex" is a dialogue about the entanglement of religion and politics hosted by Professor Jacques Berlinerblau of the Program for Jewish Civilization and produced by Professor Tom Banchoff of Georgetown's Berkley Center for Religion, Peace and World Affairs. Upcoming guests will include proponent of secular Islam Abdullahi An-Naim and Father Thomas Reese discussing the Obama administration and the Catholic community. We feel that this week's episode, as well as the series as a whole, is relevant to your blog, and we would greatly appreciate your sharing of this video with your members and community via posting it on your website. We look forward to hearing feedback from you as well on the content of the show. Please share this clip with those you feel would be interested, and feel free to contact me with any questions, comments, or recommendations!